SAWC received two grants this winter that will support efforts to manage high priority invasive plants that threaten watershed health in our region. The Copper River Watershed Project awarded SAWC an invasive plant mini-grant to control invasive knotweed in Juneau and Petersburg starting in 2018. SAWC restoration biologist John Hudson spent the fall of 2017 outreaching to numerous Juneau landowners, including those waging unsuccessful battles to eradicate the aggressive quick-spreading plant and other who were oblivious to the knotweed growing on their properties. In all, ten private landowners in Juneau committed cash to support herbicide control of 2.3 acres of knotweed. In addition to providing critical non-federal cash match for the grant, these private funds will support control efforts for two years after the grant period ends in December 2018 (Note: most knotweed infestations require at least three years of herbicide treatment for successful eradication). Petersburg resident and botanist Joni Johnson is spearheading efforts to control 2 acres of knotweed on Mitkof Island. Joni has enlisted the support of community volunteers, a youth crew from the Petersburg Indian Association, and staff from the Petersburg Borough Parks and Recreation Dept. John will be traveling to Petersburg to assist Joni and others with control efforts in late summer. The National Fish and Wildlife Foundation has awarded SAWC a Pulling Together Initiative grant. The grant is intended to help support the creation of local cooperative weed management area partnerships. Such partnerships bring together local landowners, citizens groups and weed experts to develop and implement strategies for managing weed infestations on public lands, natural areas, and private working lands. John will use the grant to reinvigorate the Juneau Cooperative Weed Management Area which was established by the Juneau Watershed Partnership several years ago. 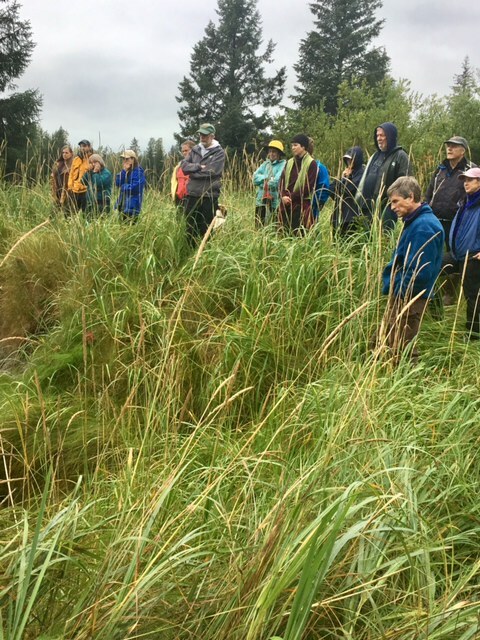 Our goal is to engage federal, state, municipal, and private landowners in the City and Borough of Juneau to cooperatively address invasive plant management. The grant also provides funds for on-the-ground projects to control invasive plants like reed canarygrass and knotweed.